Whether you know it or not, your office copy machine is probably one of the most important moving parts that helps keep your business running. Your employees rely on your office copier more than you might imagine, especially during deadlines and at times of high volume projects and tasks. It’s phenomenal what copy machines can do nowadays, too. From mobile printing, scanning to email, and everything in between, your office copy machine is probably your office’s most prized possession. With all the great things your copier does for your business, we know it can also cause some unwanted stress too. We all know, a broken copy machine is the worst, especially if your business relies on it on a day-to-day basis. Ever get the feeling that it just breaks down only during important deadlines or it’s getting to become a regular thing? 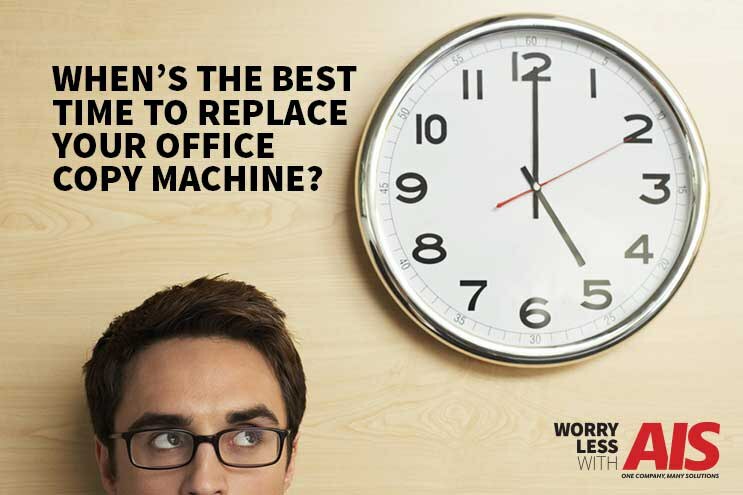 So, how do you know the best time to replace your office copy machine? Do you let it run its course, or do you nip the problems in the bud, preventing months of stress that comes with an “Out of Order” copy machine? Worry no more, we’re here to save the day! We’ve got all the answers to the questions you’re probably asking regarding the best time to replace your office copier, and we’ve made it pretty easy for you to decide. But before you check out our list of helpful tips when deciding if it’s time for a new copy machine, read an article we published on, How to Find The Best Copier Companies Near Me. This article makes the process of buying or leasing a new office copier even easier. If we could guess, you’re probably getting sick of hearing the phrase, “The copy machine broke, AGAIN!” If your employees continue to use this phrase more and more frequently, or maybe they’re abusing the copier (swearing at it, kicking it, or event hitting it) it might be time to listen to them! Listening to your employees about matters such as a lousy or slow-working copy machine is essential for company growth. It’s likely your employees have seen a decrease in efficiency as the copier is probably no longer supporting their daily tasks and jobs they need to complete for them to successfully do their job. At the time, it may be easier for you to brush their complaints under the rug and visit them at a later time. But, the time is now! Instead of putting off looking into your copy machine’s issues, take the time to do a little analysis. The sooner you identify the problems your employees are having, the happier and more productive they’ll become— or maybe the entire office. Let’s face it; all technology nowadays is growing and changing faster than it ever has, making it harder and harder to keep up with the newest and latest devices and trends. Whether it’s a smartphone or an office copy machine, you don’t have the option anymore to sit back and let your devices become outdated. Just like cell phone chargers, toner and other copy machine parts become obsolete as newer products arise on the market. Take it as a sign if you’re having trouble finding the right toner or parts for your office copy machine, especially if your copier is an older version. Copy machines are evolving all the time, and to provide your machine with the proper parts needed to function, you’ve got to make sure those parts are available. If you are in fact, having trouble finding the correct parts for your copier, and your copier is a relatively newer model, don’t hesitate to reach out to the manufacturer or the company where you bought it from. They can help you identify and purchase the right toner and products for your specific machine. To learn more about the proper care for your office copy machines, read an article we recently wrote on, Caring For Your Office Printers and Copiers. Just as technology grows and changes, your business does too. Your printing needs are probably very different today than they were five years ago. Reassessing your printing needs is something you need to look into doing if you haven’t done so already. If the function on your copy machine no longer supports the types of printing and assembling your office is doing, you’re due for an upgrade. Do you remember when you were a new business just starting out years ago? You probably weren’t printing in high volumes and most likely didn’t require any extra tools for assembling and collating your documents, such as binding or stapling. Fast forward to the present, and your business has completely changed the way it operates along with the type of work each employee is producing. You now might need newer and more advanced functions and features to support your workload, as your company has grown. The more work your company takes on and the busier your day-to-day tasks become, the more functions you’ll need and want out of your office copy machine. This not only makes your office copier easier to use but also decreases the amount of time you’ll spend assembling timely projects, allowing you and your employees more time to complete important tasks. Let’s say you’re current (older) office copy machine seems to be working just fine for you, or so you think. Just because you think your copiers doing a great job, doesn’t necessarily mean it is. You might just be used to mediocre results. The use of new technology that comes with newer copier models ensures your print jobs are printing faster, as well as resulting in much better print quality. Even something such as better print resolution can go a long way and make such a difference when it comes to the reports you’re printing, copying, and sharing. We understand change is scary, and we know the saying, “If it isn’t broke, don’t fix it.” But just because you aren’t considering your copier “broken” doesn’t mean it’s working to the fullest potential your business deserves. You’d be surprised how a little upgrade in office technology increases the productivity of your employees. New technology opens the door to so many different types and models of copy machines. If you’re having trouble narrowing down your options, take a look at an article Business News Daily published, How To Choose a Copy Machine for Your Business. Like we mentioned in above in ‘Reassessing your Printing Needs,’ the growth of your business has a lot to do with the type of office copy machine features your business needs to continue on the path of growth. Any time your business experiences growth, the tools and technology your office uses must continue to grow, too. The only way to support a more prominent clientele and employee growth is by upping your production levels, such as your office copy machine. You might think your office copy machine is suited for the amount of growth your company has experienced, but that probably isn’t the case. If you think your copier is doing a decent job now, you should see how much better your copier will do once it’s upgraded, and loaded with helpful technology to benefit multiple clients and employees. Don’t be hesitant to explore your options when it comes to upgrading a new office copy machine for your business. There are some great options available for any and all of your business needs that can not only make it easier for your employees, but also grow as your business grows.